Today I'm bringing you a mixed media canvas as part of my Design Team work for the Kraaft Shaak. Many of the products I'm using today can be purchased in their store. I'll try and provide links to everything as I can! As usual, I forgot to take process photos as I was working. For some reason when I do videos, I get all caught up in what I'm doing and forget to pause and take still photos along the way. So we'll start with the video, and then finish up with some still photos of my finished canvas. 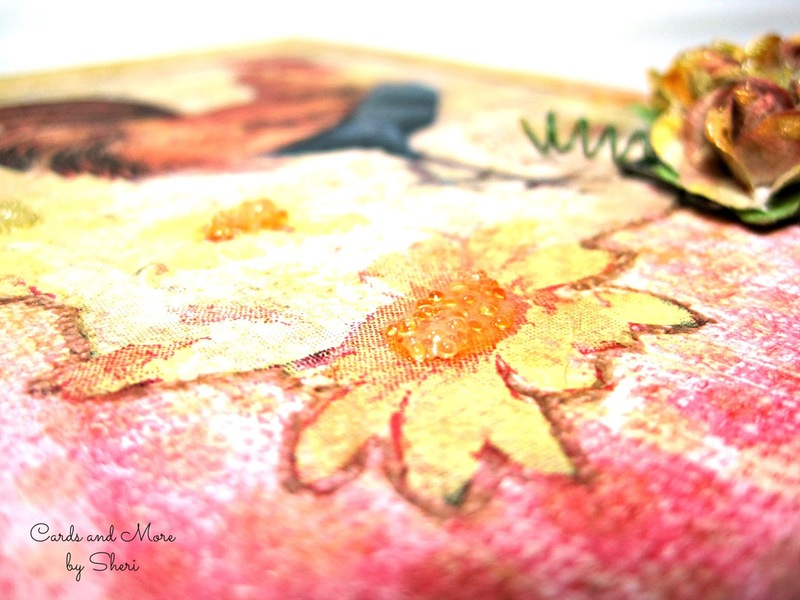 I still consider myself a "newbie" when it comes to mixed media. However, I do have some pretty amazing products in my stash already. It's a continual learning process to know how they all play with each other, but that's half of the fun. For my layers of colors on the canvas, I started with Lindy's Magicals. These are beautiful pigment powders with shimmer. I used "Rudolph's Nose Red" and "Golden Sleigh Bells." To intensify the colors, after drying the canvas I added additional color with my gelatos (red cherry and gold champagne). I added some layers of texture to the background as well. First, I used a wood grain stencil and removed some of the color with a baby wipe. Then I used another stencil and sprayed through it with Color Bloom Spray in gold foil. 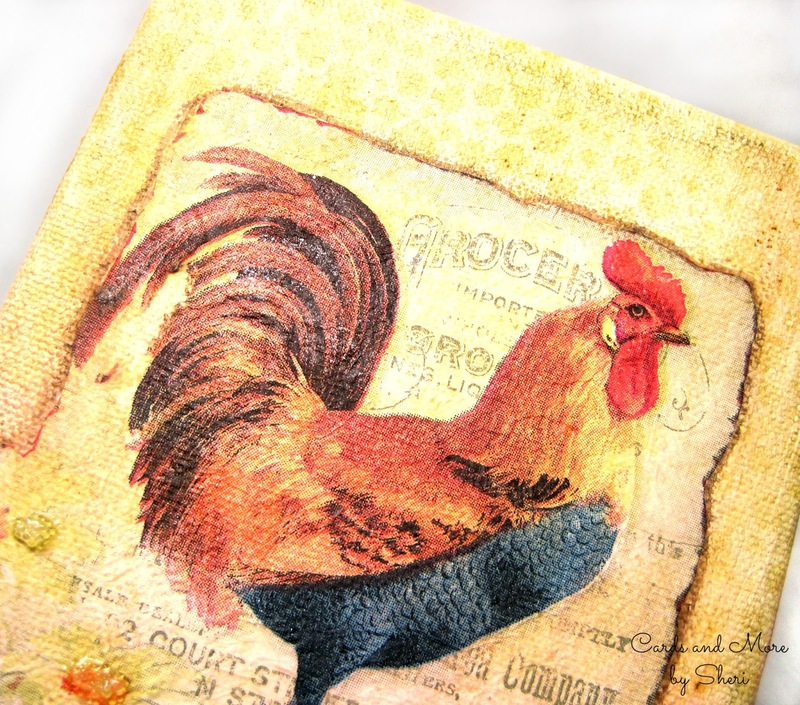 After attaching the rooster napkin image (from my mixed media kit), I also added some shimmer to Mr. Rooster with a Wink of Stella pen. 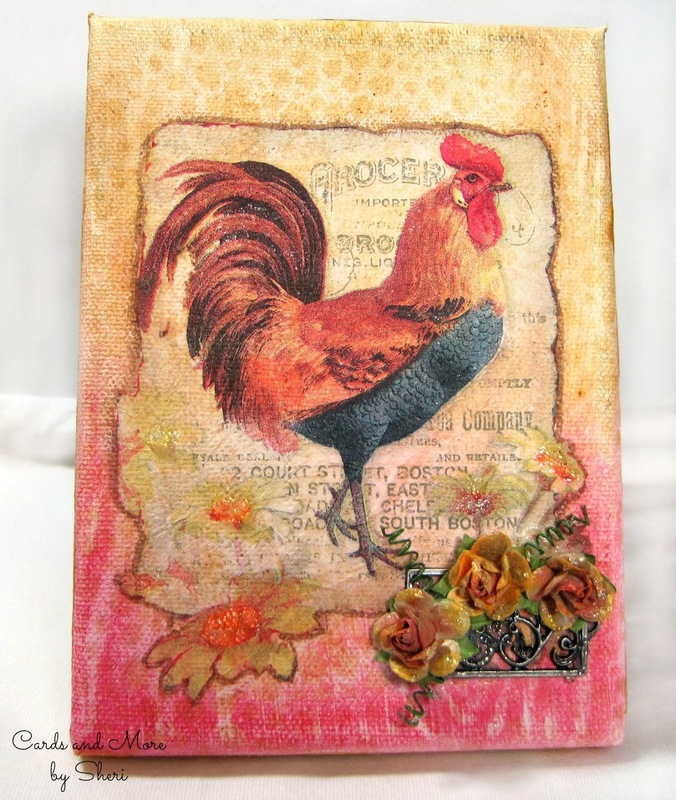 Everyone needs a sparkly rooster, don't you think?? Some gold crackle paste around the edge gave the perfect "frame" to the canvas. Just remember that the thicker you apply it, the bigger the cracks will be when it dries. 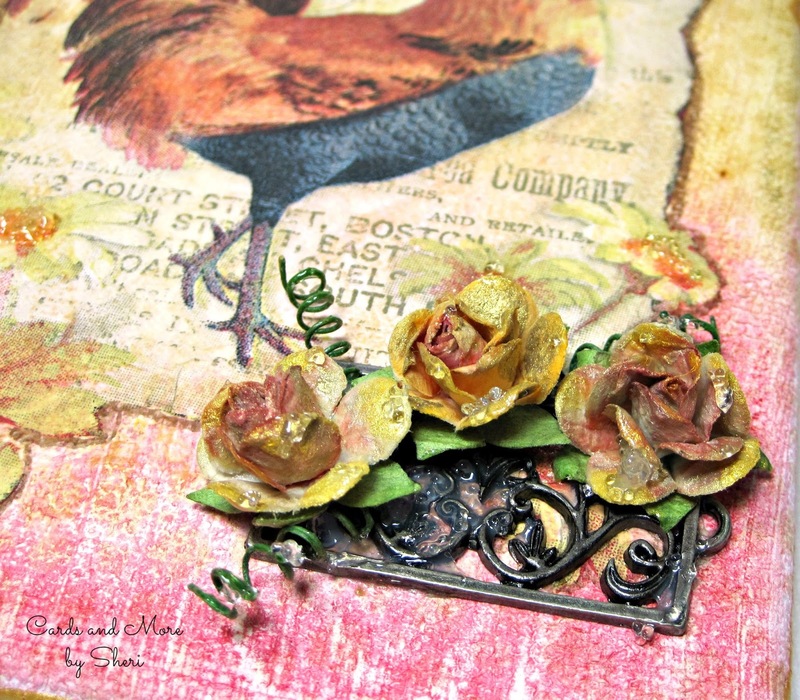 I used a metal element from the Finnabair Mechanicals Plate and Label set. It reminded me of a trellis or wrought iron fence. 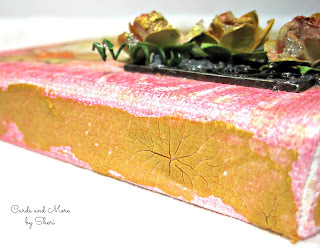 This piece, along with my paper flowers and vines, was attached to the canvas with 3D Gloss Gel. 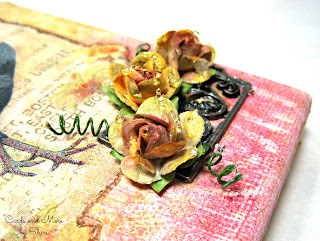 For extra sparkle and details, I added bits of glass bead gel to the paper flowers, metal piece, and the centers of the flowers on the napkin. I hope you enjoyed my little rooster canvas. I'm pretty pleased with him, and that's saying a lot for me! That's great, Shel. 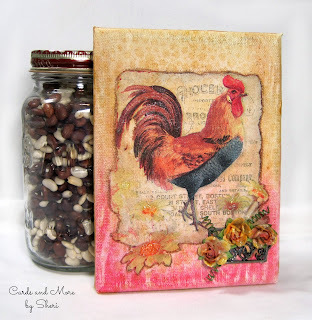 Don't forget to share your rendition of Mr. Rooster! 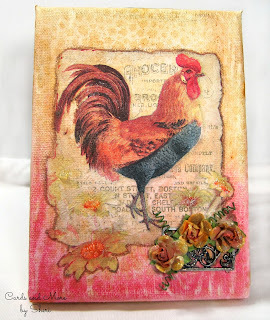 Love that rooster! Great project. Great job here, Sheri. I love the fussy cut edge around the napkin, especially the flower! And the glass beads are perfect! Thanks, Sylvia. I was really happy how it turned out! Thank you, Patty! I'm glad you liked Mr. Rooster!